I had no list of places got to visit coming to Barcelona. I was going to rely on my host on that and I did. That’s another cool thing about CS. Jaume have to work, today being Friday, but he took my map and marked the places I can go visit. Having 2 more days, he sectioned the city and created a route for me to take, although a bit ambitious one. I am not going to cover that much area in 2 days without growing a pair of wings. By now, taking the metro is 2nd nature to me. haha. I was advised to get a ticket for 10 rides which will come out cheaper since I have a lot of places to cover. Before I arrive here, my friends who visited Europe before me said the only place that they experienced language obstacle was in France as they don’t speak French. I wonder when they learned to speak Catalan?? English is not that widely spoken here, even in the metro ticket machines, there were no English menu. And to think the city is flooded with tourists! I set out around noon time. 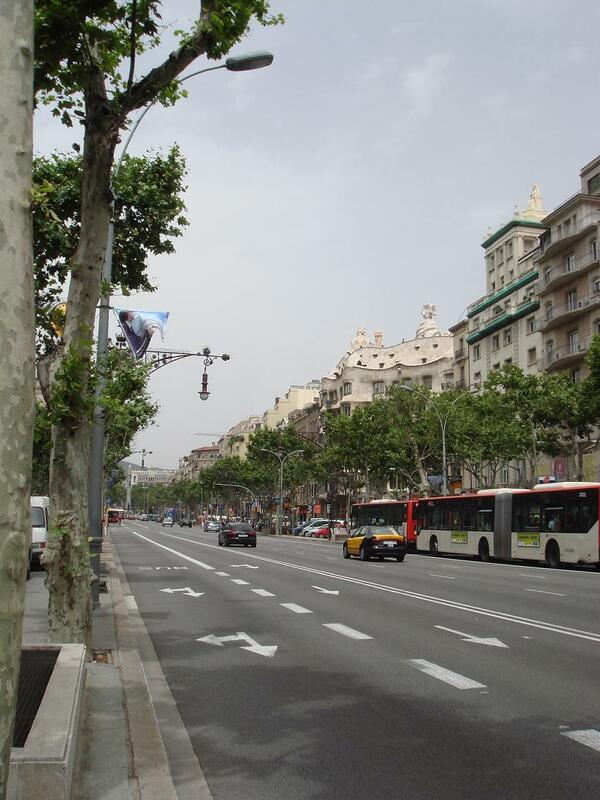 I decided to start at Pg de Gràcia where La Pedrera & Casa Battlo are located. I was a bit hungry and went in a restaurant where you can eat at the bar. For the first time, I felt a pang of loneliness swept over me. Is this how it feels traveling alone? Can I do it? I have oh so many days to go!! I was questioning my decision to travel on my own. I needed to catch my breath. People are doing this all the time. I read Audrey’s Awesome Adventure and she was on her own for 6 months! I can do this, I firmly decided. The architecture of the whole street in Pg de Gràcia is awesome! The Gaudi inspired city is great and I’m feasting my eyes on it, temporarily forgeting my earlier worries. I take pictures here and there. And noted that this is one of the advantage of being on your own, you don’t hold people up while taking picture every 3 seconds. There was a long line going into La Pedrera, but I thought what am I in a hurry to go to anyway. Surprisingly, it took about 10 or so minutes and I was in. La Pedrera was one of Gaudi’s famous work. It was designed for the Mila family 1906. The architecture was very different from the ones I’ve seen in France. The shapes, the curves in the wall, the twisted metal rails, the colors. It’s fantastic. It truly is born out of a prolific mind! Then I came into the attic, where it was a small museum showcasing Gaudi’s works. There were scale models and documentaries of his masterpieces. Immediately I’ve become a fan. I’m was super impressed with his theories and works. I couldn’t get enough of Gaudi so I headed to Casa Batllo, where just the facade was breathtaking! Unfortunately something was going on and they are not allowing tourists inside that day. I took the metro and headed for La Sagrada Familia. La Sagrada Familia is Gaudi’s most famous work. He devoted 40 years on this project. It started construction in 1892 and is still on going. The outer structure is already erected and over 2 million people have visited the church even while it’s still under construction. The intricacies and details of the church’s facade is nothing like you’ve ever seen. It’s just magnificent. Parc Guell is another of his work of art. I am out of adjectives already. He he. Let’s just say I got addicted to mosaic after the visit. I especially love the mosaic bench above the colonade. The bench curves are perfect to reat your back on. Lots of tourists taking a nap there and I could imagine how comfortable it is to do so. I have a video uploaded on the said bench. Around 9pm I met up with Anibal outside metro station of Diagonal. He was already with Catarina, another traveler who came from Portugal. They first met when he visited Açores a few months before, through couchsurfing, of course. We exchanged pleasantries while waiting for Marie. I was amazed meeting and hanging out with these new people in a city I visited for the first time. I contacted Anibal while still in Manila planning for my trip. He hailed from Argentina but been living & working in Barcelona for a few years. Marie finally arrived dying for beer and cigarette, immediately I warmed up to her. Lol. Marie’s a québécoise. She’s staying with a family in Barcelona as an au pair while attending the university. en higher, energy level, I mean. The crowd is youngish, around early 20’s to about 35, and mostly in big groups, most probably travelers. We walked through several plaças and couldn’t find an empty table. So while walking, we each got a 1euro beer from one of those immigrants peddling beers from their backpacks. Finally we ended up at Plaça del Sol again, for the 2nd time or 3rd time, hoping that a table will be free soon. The plaça is surrounded by bars at 4 sides. As the crowd got thicker, we gave up and just sat down the floor of the plaça and exchange stories. After midnight, we moved to a British Pub @ Plaça Reial, Sidecar Factory, and danced until 4am. Then I remembered, I don’t have a key to Jaume’s place!